Sempai (先輩 :せんぱい) is used to address or refer to one's senior colleagues (lower rank black belts 1st Dan-3rd Dan) in a dojo. Sensei (先生 :せんせい) (literally meaning "former-born") is used to refer to or address teachers. Used for addressing your teacher and blackbelts 4th Dan and Above. Renshi (錬士 : れんし): Polished Instructor. (Skilled person or expert teacher) Awarded to Godan (5th Dan) and above. Shihan (師範 : しはん), means chief instructor; usually awarded at Nanadan (7 degree Blackbelt). Kyōshi (教士 : きょうし) refers to an advanced teacher. (Senior Teacher/Expert). Awarded to 7th Dan and above. Hanshi (範士 : はんし) refers to a senior expert considered a "teacher of teachers". This title is used for the top few instructors of that style, and is sometimes translated "Grand Master". Awarded to 8th Dan and above. 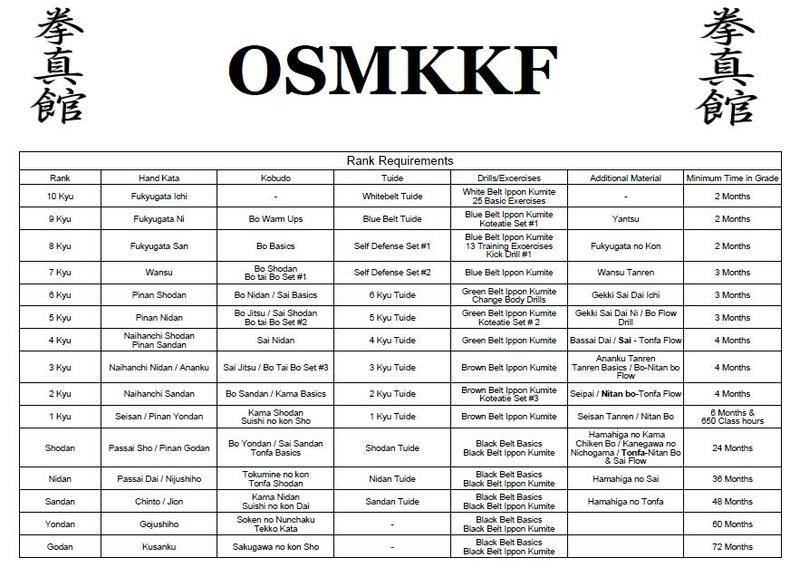 *Additional Materials are not OSMKKF Requirements. They are taught as extra Drills and Kata. The rank they are taught at are subject to change based on the student and is only taught when the instructor feels the student are ready.